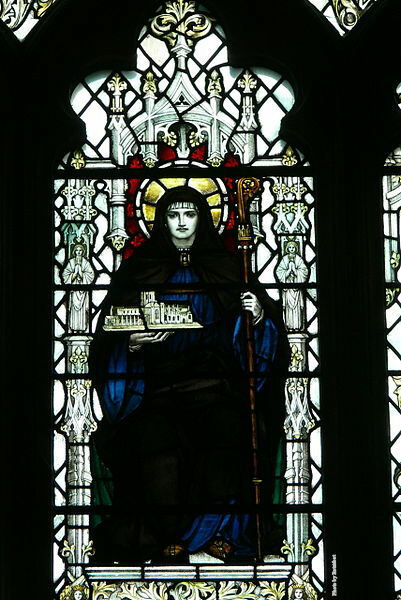 Benedictine, patroness of Chester, Abbess of Weedon, Trentham, Hanbury, Minster in Sheppy, and Ely, born in Staffordshire early in the seventh century; died at Trentham, 3 February, 699 or 700. Her mother was St. Ermenilda, daughter of Ercombert, King of Kent, and St. Sexburga, and her father, Wulfhere, son of Penda the fiercest of the Mercian kings. St. Werburgh thus united in her veins the blood of two very different races: one fiercely cruel and pagan; the other a type of gentle valor and Christian sanctity. In her, likewise, centered the royal blood of all the chief Saxon kings, while her father on the assassination of his elder brother Peada, who had been converted to Christianity, succeeded to the largest kingdom of the heptarchy. 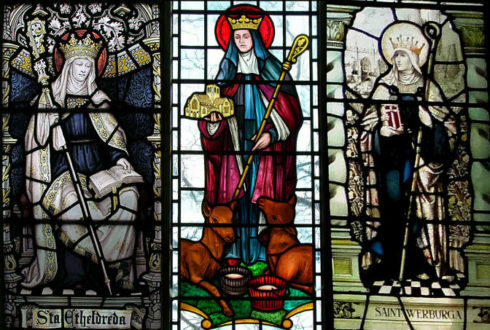 From L to R: St. Etheldreda and St Withburga, sisters of St. Sexburga; St. Werburgh, the granddaughter of St. Sexburga. All three are incorrupt, though St. Werburgh’s grave was destroyed under Henry VIII. Whether Wulfhere was an obstinate pagan who delayed his promised conversion, or a relapsed Christian, is controverted, but the legend of the terrible and unnatural crime which has been imputed to him by some writers must here be dismissed on the authority of all earlier and contemporary chroniclers, as the Bollandists have pointed out. The martyrs, Sts. Wulfald and Ruffin, were not sons of Wulfhere and St. Ermenilda, nor victims of that king’s tyranny. Ermenilda at once won the hearts of her subjects, and her zeal bore fruit in the conversion of many of them, while her influence on the passionate character of her husband changed him into a model Christian king. Werburgh inherited her mother’s temperament and gifts. On account of her beauty and grace the princess was eagerly sought in marriage, chief among her suitors being Werebode, a headstrong warrior, to whom Wulfhere was much indebted; but the constancy of Werbrugh overcame all obstacles so that at length she obtained her father’s consent to enter the Abbey of Ely, which had been founded by her great- aunt, St. Etheldra, and the fame of which was widespread. Wulfhere did not long survive his daughter’s consecration. On his death, St. Ermenilda took the veil at Ely, where she eventually succeeded her mother, St. Sexburga, as abbess. Kenred, Werburgh’s brother, being a mere child at his father’s death, his uncle Ethelred succeeded to the throne. This king invited St. Werburgh to assume the direction of all the monasteries of nuns in his dominion, in order that she might bring them to that high level of discipline and perfection which had so often edified him at Ely. The saint with some difficulty consented to sacrifice the seclusion she prized, and undertook the work of reforming the existing Mercian monasteries, and of founding new ones which King Ethelred generously endowed, namely, Trentham and Hanbury, in Staffordshire, and Weedon, in Northamptonshire. 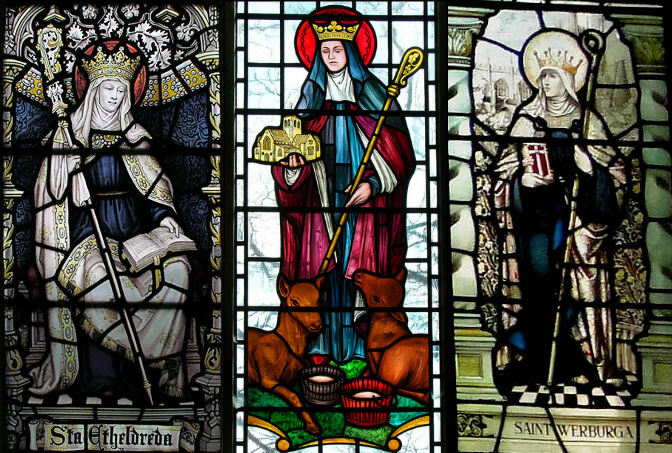 It had been the privilege of St. Werburgh to be trained by saints; at home by St. Chad (afterwards Bishop of Lichfield), and by her mother, and in the cloister by her aunt and grandmother. Her position worked no change in the humility which had always characterized her, so that in devotedness to all committed to her care she seemed rather the servant than the mistress. Her sole thought was to excel her sisters in the practice of religious perfection. God rewarded her childlike trust by many miracles, which have made St. Werburgh one of the best known and loved of the Saxon saints. That of the stolen goose appealed most to the popular imagination. The story, immortalized in the iconography of St. Werburgh, relates that by a simple command she banished a flock of wild geese that was working havoc in the cornfields of Weedon, and that since then none of these birds has been seen in those parts. She was also endowed with the gifts of prophecy and of reading the secrets of hearts. Knowing how devoted her different communities were to her and how each would endeavor to secure the possession of her body after death, she determined to forestall such pious rivalry by choosing Hanbury as her place of burial. But the nuns of the monastery of Trentham determined to keep the remains. They not only refused to deliver them to those who came from Hanbury, but they even locked up the coffin in a crypt and set a guard to watch it. The people of Hanbury sent out anew a large party to make good their claims. Reaching Trentham at midnight all the bolts and bars yielded at their touch, while the guards were overpowered by sleep and knew not that the coffin was being carried to Hanbury. So numerous and marvelous were the cures worked at the saint’s tomb that in 708 her body was solemnly translated to a more conspicuous place in the church, in the presence of her brother, Kenred, who had now succeeded King Ethelred. In spite of having been nine years in the tomb, the body was intact. 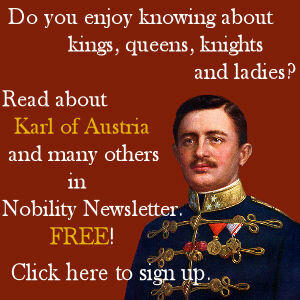 So great was the impression made on Kenred that he resolved to resign his crown and followed in his sister’s footsteps. 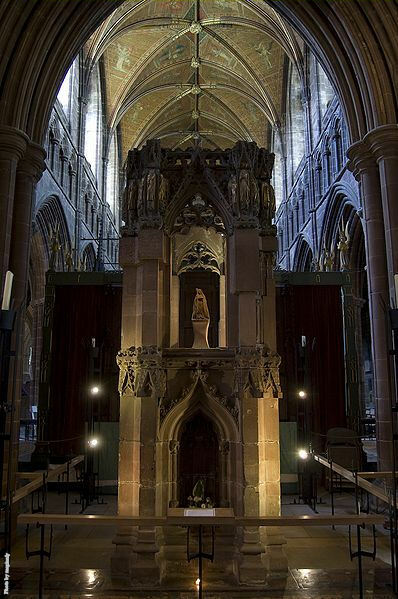 In 875, through fear of the Danes and in order to show greater honor to the saint, the body was removed to Chester. 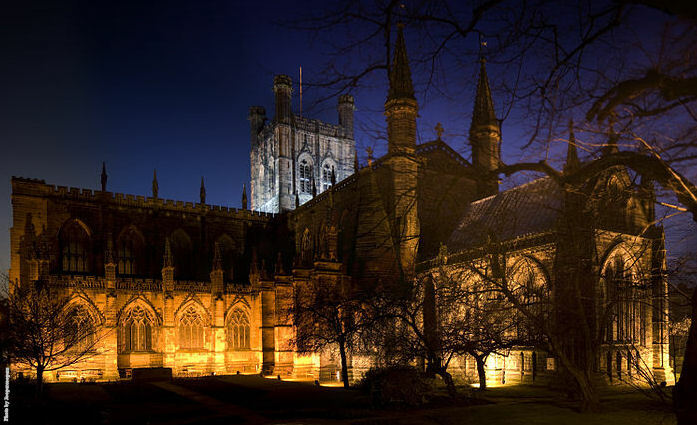 The Church of St. Peter and St. Paul, on the site of the present cathedral of Chester, was rededicated to St. Werburgh and St. Oswald, most probably in the reign of Athelstan. The great Leofric, Earl of Mercia (who was likewise styled Earl of Chester), and his wife, Lady Godiva, repaired and enlarged the church, and in 1093, Hugh Lupus, Earl of Chester, richly endowed the abbey and its church. By the instrumentality of this noble, Chester, which had been in the hands of secular canons, became a great Benedictine abbey, the name of St. Anselm, then a monk at Bee, being associated with this transformation. They abbey possessed such immense influence and position that at the time of the suppression under Henry VIII the Earl of Derby was the abbot’s seneschal. In the vast wave of iconoclasm that swept over the country in that tyrant’s reign the cathedral was sacked by apostates who scattered St. Werburgh’s relics. Fragments of the shrine were used as the base of an episcopal throne. Many of the labels and figures had been mutilated, and while restoring them the workmen by mistake placed female heads on male shoulders and vice versa. Only thirty of the original figures remain, four having been lost. Late all these fragments were removed to the west end of the south choir aisle, where they have been placed nearly in the original position of the shrine, which is 10 feet high. St. Werburgh’s feast is celebrated 3 February. 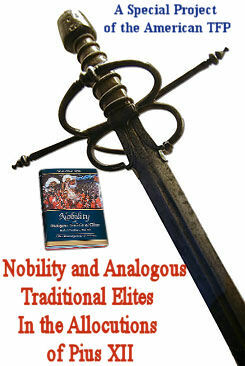 Acta SS., I FEB.; BRADSHAW, Metrical Holy Lyfe and History of Saynt Werburge, etc., ed. HAWKINS (printed in facsimile for the Chetham Society, 1848); BUTLER, Lives of the Saints (london, 1833); DUGDALE, Monasticon anglicanum (London, 1846); DUNBAR, Dict. of Saintly Women (London, 1905), s.v. ; HIATT, Chester, the Cathedral and See (London, 1898); LELAND, Collectanea (London, 1770); LEWIS, Topographical Dict. of England (London, 1831), s.v. ; Nova legenda Angliae, ed. HORSTMAN (Oxford, 1901); SPELMAN, Hist. and Fate of Sacrilege (London, 1895); TANNER, Notitia Monast. (London, 1744).